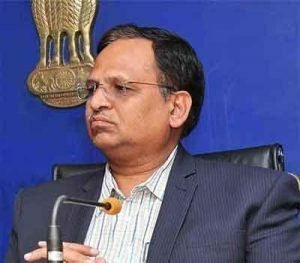 NEW DELHI: Delhi Health Minister Satyendra Jain stressed on administering Hepatitis B vaccination to “everyone” to prevent the spread of the deadly disease and said that missing even a single person could negatively affect efforts to eradicate it. “It is very unfortunate that vaccination against Hepatitis in Delhi is given only to 70-80 per cent people. It should have been 100 per cent. Even 90 per cent is not enough. Everyone should be vaccinated. We can achieve the 100 per cent vaccination target in two years if everybody supports it,” he said at a Hepatitis B awareness programme organised by Institute of Liver and Biliary Sciences (ILBS) in New Delhi. Mr Jain asked ILBS to prepare a leaflet for creating awareness about the Hepatitis B virus, saying people have little knowledge of “the life-threatening disease”. He said the Delhi government had been providing free medicine for Hepatitis since February. ILBS Director S K Sarin said he was “very sad” when he came to know that people in the country know little of the Hepatitis B virus. Sarin recalled how the programme got underway with two Mumbai-based girls, who started the “Yellow Ribbon Campaign” 18 years ago, to spread awareness about the Hepatitis B virus making him a part of it. “There are 12 million Hepatitis C-affected people in the country and 40 million suffer from Hepatitis B. It is transmitted through blood and to a newborn from his mother. “If you vaccinate, no one will get the virus. And by 2080, we can eliminate it. We treat those who are infected by it and those who are not protected. This is Delhi government’s commitment,” he said. “During a survey in a Delhi school, we asked some children if they knew how the Hepatitis B virus is transmitted. Some said it spreads by eating together, piercing ears…I was very sad to hear this. We also found that only 80 per cent girls and three-fourth of the boys were vaccinated,” he said. “We then started this programme to create awareness about Hepatitis B. It started in 1998 and we were almost 10 to 12 years ahead of the World Health Organization. Delhi and District Cricket Association has also helped us make people aware about the virus by advertising and putting up hoardings,” he said. This year, our aim is to prevent the unaffected people from the Hepatitis B virus, Mr Sarin said.